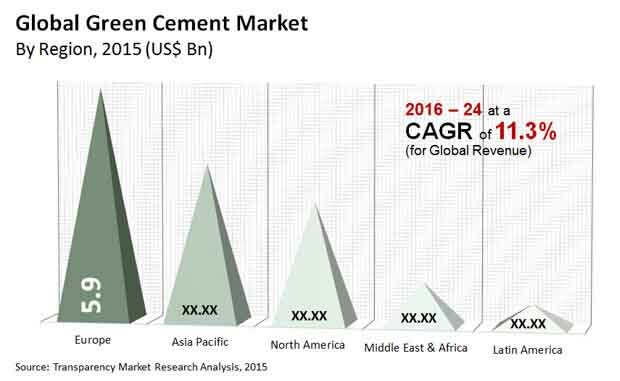 The global green cement market is dominated by Heidelberg Cement AG, Lafarge S.A., China National Building Material, Taiheiyo Cement Corporation, and CEMEX S.A.B. de C.V., which held a total of 51% of the market in 2015, states Transparency Market Research (TMR) in its latest report. These companies are focusing on strategic alliances so as to expand their capacity. Constant effort and focus have led to technological developments as well as product differentiation and this is helping companies to grow extensively. As per Transparency Market Research, the global green cement market will be worth US$38.10 bn by 2024. On the basis of geography, Asia Pacific is anticipated to be a very lucrative market for green cement on account of rapid industrialization and urbanization. The increasing number of construction and building activities is also driving the growth of this market. By application, residential sector is anticipated to lead in the years to come on account of the rising density of population across Urban regions which in turn has fuelled number of residential projects. One of the key factors boosting the growth of the global green cement market is the number of construction and building activities which has risen in the last few decades. With growing update of alternative fuels which are derived from waste materials such as solid recovered fuels, foundry sand, animal meals, used oil, filter cakes, sewage sludge, and fly ashes, the demand for green cement is also increasing. The major factor boosting the growth of this market is the growing need to cut down on carbon emissions and using clean and green fuel. The global green cement market also receives support from governments across the globe encouraging sustainable building and green architecture, certified under leader in energy and environment design (LEED). As green cement is known to safeguard buildings from heat stress or sulphate attacks caused due to moisture or water, their demand is increasing manifolds. Green cement also offers superior resistance as compared to OPC and therefore an increasing number of bridges and pavements, nuclear power plants, and other infrastructure projects are being developed using green cement. On the other hand, the strength of the green cement depends on the type of industrial waste use for the manufacturing processes and therefore varies. For instance, the use of low calcium fly ashes results in low strength and such building projects lead to failure. This uncertainty of the quality of green cement is the biggest challenge which is hampering the growth of this market.